The papers in the issue: John McDade, “Simone Weil and Gerard Manley Hopkins on God, Affliction, Necessity and Sacrifice”; Simini Rahimi, “Swinburne on the Euthyphro Dilemma. 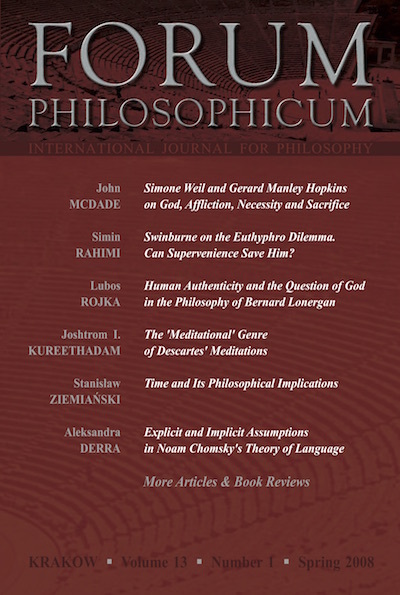 Can Supervenience Save Him?”; Lubos Rojka, “Human Authenticity and the Question of God in the Philosophy of Bernard Lonergan”; Joshtrom Isaac Kureethadam, “The 'Meditational' Genre of Descartes' Meditations”; Stanisław Ziemiański, “Time and Its Philosophical Implications”; Aleksandra Derra, “Explicit and Implicit Assumptions in Noam Chomsky's Theory of Language”; Manuel Rebuschi, “Czeżowski's Axiological Concepts as Full-Fledged Modalities. We Must Either Make What Is Good, Or Become Revisionists”; Mostafa Taqavi, and Mohammad Saleh Zarepour, “The Strong Version of Underdetermination of Theories by Empirical Data. Comments on Wolenski's Analysis”; Adam Świeżyński, “The Evolutionary Concept of Human Death”; Daniel Lauriel, “Making “Reasons” Explicit. How Normative is Brandom's Inferentialism?”.